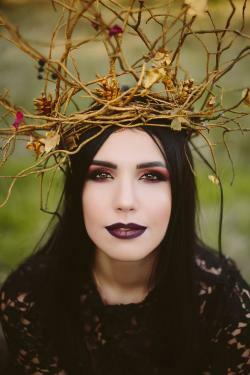 Whether you're a hopeless romantic or a dark angel, Gothic makeup ideas are a necessity for achieving vampish cosmetic artistry. Dressing gothic is a risqué head to toe project. For some, it is a daily part of life. Others may carry on a fetish or secret affair with the lifestyle, indulging only in the midst of private clubs and parties. What Does It Mean to Be a Goth Teen? Gothic style can define two extremes: gothic that lends itself to the Edwardian era romantics who wear corsets and loose tendrils, or the dark city vamps who celebrate the underground scene. Whether you're a closet goth or a lovesick heroine, you can't expect to pull off the goth image convincingly without every physical detail being accounted for. The face, lips, eyes, nails, hair and clothing must all work harmoniously to create the faultless bloodletting image goth is famous for. Make note of these crucial details and you'll be vamped out by the midnight hour! Creating a white face is tricky and takes commitment. If you have ethnic skin, you'll still be able to pull off gothic whiteface techniques, but you'll have best results staying within two levels of your skintone. The whiteface process is the most labor intensive effort you'll put into your gothic makeup ideas routine. Creating the perfect foundation for your withered look is easy with the use of kabuki techniques and white powder. Invest in a high quality kabuki brush and the best light kabuki facial powder and face paint that you can afford. Spend time applying the paint and powder, and make sure you blend thoroughly to soften the edges. If you are meddling into goth by way of Edwardian poet style, you may choose a foundation and powder one shade lighter than your skin tone, rather than two. You may also wear a cheek rouge in crimson or berry to enhance your dreamy appearance. When it comes to nails, bloodbath colors look delicious on vamp girls and poetic vixens . Keep your nails short and squared and paint them with all the gutter and gore colors available on the market. Cosmetic companies such as Sinful and piCture pOlish offer a great selection of grey, blood red and deep shades of blue perfect for the goth look. Over a dozen years ago Chanel changed the nail scene forever. After the introduction of Vamp, a blackish brown red, over one thousand women went in waiting just to get that color on their tips. It just wouldn't be right if we didn't mention Chanel's famous Vamp nail polish as the perfect choice for all gothic gals . Go vampish and by all means, avoid pink nails and French manicures. Don't mix pretty nails with gothic, any day of the week. The best part of gothic dressing is the creative outlet. Many closet goths exploit the goth world as a way to express their creativity, especially if they're locked in a humdrum daily routine. In the makeup world, eyes are the easiest facial feature to play up and change. Go crazy with the liquid liner and deep shadows. Separate lashes with red mascara, draw cat eye lines or crescent lines on the outer eyes. As long as your look remains dark and mysterious, feel free to play and experiment. Practice a few eye techniques in the comforts of your own dungeon before venturing out into the wild goth scene. Goth gals (and guys) wear all shades of blood red lipsticks. Line your lips with a deep maroon liner and use a brush to apply a blood splattered shade. Lip stains are a perfect alternative to a lipstick and they have the benefit of increased staying power. Lip stains pout that just bitten look that all vampires flaunt, and they look beautiful on a gal who's after an Edwardian glow. Lighter eye colors: You'll probably still have a collection of black eyeliner pencils and liquid liner in shades of midnight, but your eyeshadow colors can be pale to deep pinks, sparkling white and various shades of purple, from light lavender to violet. Creamy skin: If you prefer a dewy look to your skin, don't hide it under heavy foundation. Even out any imperfections with concealer if necessary; follow with a light dusting of loose, translucent powder. Softer lips: Red lips are always good for goths, but you can also try pale pinks that closely match your natural lip color. Even if it's just for fun, gothic dressing is inspiring and creative. Next time you've got a few hours to spare, unleash your inner goth girl and let her out to play. It's okay, we won't tell!